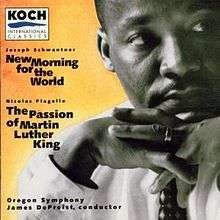 Joseph Schwantner: New Morning for the World; Nicolas Flagello: The Passion of Martin Luther King is a classical music album by the Oregon Symphony under the artistic direction of James DePreist, released by Koch International Classics in 1995. Recorded at the Arlene Schnitzer Concert Hall in Portland, Oregon, in September 1994, the album is a tribute to Martin Luther King, Jr. and was released in his honor on the following holiday in his name. The album features two works by American composers, each with text from speeches by King: Joseph Schwantner's New Morning for the World ("Daybreak of Freedom") and Nicolas Flagello's cantata The Passion of Martin Luther King. Both works include performances by Raymond Bazemore, who serves as narrator on the former and provides bass vocals on the latter. On the album's release date, more than 30 United States radio stations broadcast the album version of Schwantner's composition to commemorate the civil rights leader. 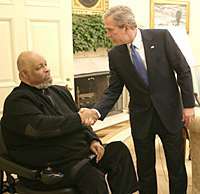 Proceeds from the album's sale benefited the King Center for Nonviolent Social Change. Produced by Michael Fine and engineered by Fred Vogler, the recording reached a peak position of number three on Billboard's Classical Albums chart and remains the Oregon Symphony's best-selling album as of 2013. The album, 58 minutes and 54 seconds in length, contains two compositions: Joseph Schwantner's New Morning for the World ("Daybreak of Freedom") and Nicolas Flagello's cantata The Passion of Martin Luther King. Both compositions contain text from speeches by King delivered during the civil rights movement. The first track, 23 minutes and 27 seconds in length, features Schwantner's work. The Passion of Martin Luther King, 35 minutes and 17 seconds in length, is separated into nine tracks. The album was produced by Michael Fine and engineered by Fred Vogler. Coretta Scott King wrote the introduction for the album's liner notes. Works on the album feature text by Martin Luther King, Jr. (pictured in 1964). New Morning for the World, composed in 1982 on commission from AT&T, premiered on January 15, 1983 (King's birthday) at the John F. Kennedy Center for the Performing Arts; David Effron conducted the Eastman Philharmonia, and Willie Stargell, then first baseman and team captain of the Pittsburgh Pirates, served as narrator. Schwantner selected words from public speeches by King that spanned more than a decade of his life. In the album's liner notes, program annotator and classical music radio host Jim Svejda described the work as having "equal parts" for the orchestra and the speaker, with King's words "supported and illuminated by an orchestra fabric of unusual variety and flexibility". Music critics compared Schwantner's composition to Aaron Copland's Lincoln Portrait because of its prominent narrative passages and its "broad and lyrical scoring that sounds unmistakably American". In describing the work, Melinda Bargreen of The Seattle Times wrote that percussion and "soaring" strings helped to emphasize King's orations. 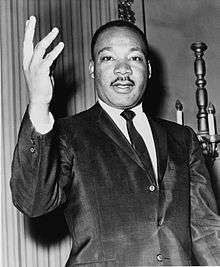 New Morning for the World contains text from the following speeches and writings by King: "Stride Toward Freedom" (1958), "Behind the Selma March" (1965), and "Letter from Birmingham Jail" (1963); the composition ends with King's "I Have a Dream" speech. The Passion of Martin Luther King was composed in 1968 following King's assassination. The Passion was first recorded in London in 1969, with Ezio Flagello, the composer's brother, as the bass baritone soloist. This performance was eventually released by Naxos American Classics in 2012. DePreist conducted the National Symphony Orchestra's first performance of the work at the Kennedy Center on February 19, 1974. Music critics drew comparisons to Johann Sebastian Bach's Passions, which recounts Jesus' death. The Oregon Symphony album was the first published recording of the work. Bazemore provided bass vocals, with additional vocals by the Portland Symphonic Choir, directed by Bruce Browne. The nine sections of the work are performed with a brief pause in between. On the album's release date, more than 30 United States radio stations broadcast the album's version of New Morning for the World to commemorate King. Martin Luther King III and Schwanter celebrated the album's release at Phipps Plaza in Atlanta. Proceeds from sales benefited the King Center for Nonviolent Social Change. The album received positive commercial and critical reception. It reached a peak position of number three on Billboard's Classical Albums chart and remains the Oregon Symphony's best-selling album as of 2013. In his review for Deseret News, music critic William S. Goodfellow wrote that each work contained "sophistication and substance". Goodfellow said of Schwanter's composition: "The more exotic scoring... as well as Schwantner's minimalistic treatment of the music's more militant episodes, gives it a drive and dramatic punch of its own." The album features Raymond Bazemore as narrator; Goodfellow described Bazemore's "occasionally sing-song narration" in New Morning for the World as "Lincolnesque". He wrote that Flagello's work contained "writing of remarkable clarity and Italianate warmth", but thought Bazemore's voice sounded hoarse towards the end and preferred the solo sections in New Morning for the World. The Seattle Times's Melinda Bargreen called the album "strong and emotionally convincing", and praised "excellent performances with strong soloists". She wrote that both works were composed in "styles that are distinctively modern, but tonal and accessible". Bargreen described Bazemore's voice as "deeply affecting" and complimented DePreist for conducting "with an obvious passion for the music, drawing remarkably detailed and virtuosic performances from his orchestra." Tim Smith of the Sun-Sentinel said both works were "well worth hearing" and encouraged orchestras to explore the pieces, along with works by other African-American composers, to provide the public with broader programming. Smith described New Morning for the World as "remarkably lyrical" and "quite dramatic"; he found Bazemore's sing-song narration to be "too affected" but found the conclusion "touching" and complimented the orchestra for its overall "sturdy, communicative" performance. Smith called Flagello's score "unabashedly romantic" and described as effective the work of Bazemore, DePreist and the orchestra. Track listing adapted from Allmusic and the album's liner notes. Orchestra roster adapted from the album's liner notes. "*" designates acting orchestra members; "**" designates musicians on a leave of absence. 1 2 3 4 5 6 7 8 9 Bargreen, Melinda (January 12, 1995). "Two Works Celebrate Words Of King". The Seattle Times. The Seattle Times Company. ISSN 0745-9696. OCLC 9198928. Retrieved February 22, 2013. 1 2 3 "Joseph Schwantner: New Morning for the World; Nicolas Flagello: The Passion of Martin Luther King". Allmusic. Rovi Corporation. Retrieved February 21, 2013. 1 2 3 4 5 6 7 8 9 Goodfellow, William S. (January 15, 1995). "2 Pieces on King Provide Sophistication, Substance". Deseret News. Salt Lake City, Utah: Deseret News Publishing Company. ISSN 0745-4724. Retrieved March 14, 2013. 1 2 3 4 Smith, Tim (January 15, 1995). "Fitting Remembrances". Sun-Sentinel. Fort Lauderdale, Florida: Tribune Company. ISSN 0744-8139. Retrieved March 26, 2013. ↑ Rosenblum, Joshua (October 2012). "N. Flagello: Passion of Martin Luther King; L'Infinito; The Land". Opera News. Metropolitan Opera Guild. 77 (4). ISSN 0030-3607. Retrieved March 28, 2013. ↑ "Biographical notes". Flagello.com. Retrieved March 28, 2013. ↑ Waleson, Heidi (January 14, 1995). "Keeping Score". Billboard. Nielsen Business Media, Inc. 107 (2): 31. ISSN 0006-2510. Retrieved March 28, 2013. ↑ "Forever King". Billboard. Nielsen Business Media, Inc. 107 (4): 10. January 28, 1995. ISSN 0006-2510. Retrieved March 26, 2013. ↑ Stabler, David (November 30, 2011). "Oregon Symphony's CD hits Billboard's classical chart". The Oregonian. Portland, Oregon: Advance Publications. ISSN 8750-1317. Retrieved February 21, 2013. ↑ "Oregon Symphony to Record American Repertoire". NewMusicBox. New Music USA. May 1, 2001. Retrieved February 21, 2013. ↑ "Oregon Symphony: A Brief History". Oregon Symphony. Retrieved February 21, 2013. ↑ "Joseph Schwantner: New Morning for the World; Nicolas Flagello: The Passion of Martin Luther King: Credits". Allmusic. Rovi Corporation. Retrieved February 22, 2013.